Young Muslims joined members of the local community on New Year’s Day to help clean up Croydon. It’s important to keep Britain’s streets clean after the new-year festivities. So youth from the Ahmadiyya Muslim Youth Association (AMYA) Croydon, celebrated New Year by waking at the crack of dawn, offering communal prayers for a prosperous 2017, then after the morning prayer, taking to the streets, brooms and bin bags in hand. as part of its ‘Big Street Clean’. The campaign is one of many charitable and community initiatives carried out by the AMYA across the winter break. The group also organised blood donation sessions, charity collections, children’s hospital and nursing home visits, and campaigns to bring food to homeless people. “Our members have enjoyed living in Croydon for decades and so any opportunity to help our local community is much welcome. As well as cleaning the streets of Croydon town centre, the groups also helps Croydon Night Watchin feeding the homeless of Croydon, another action to give back to the country as loyal citizens. The spirit with which AMYA members embrace charitable and community activities is encapsulated by the following statement of the founder of the Ahmadiyya Muslim Community, Hazrat Mirza Ghulam Ahmad, who said: “My desire, my wish and my objective is serving humanity. It’s my job, my faith, my inspiration and my way”. AMYA is an auxiliary body of the Ahmadiyya Muslim Community, a religious and charitable Muslim organisation with more than 8,600 members spread across 124 chapters in the United Kingdom. 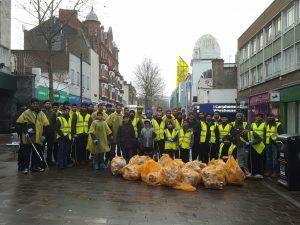 Share the post "How Muslims for Humanity kicked off 2017 by cleaning Croydon’s streets"